I cannot tell you when my love affair with mustard began. We always had a small variety of mustards in the house which included hot English, Dijon and wholegrain mustards without fail. I was not a huge fan of this condiment until my grandfather took me shopping in Sydney. He purchased a number of jars to add to the pantry. The shelves already had a few varieties I had not heard of, and now I could try loads more. It was amazing how each mustard brought something unique to the table. Since then, my collection has grown and grown with my favourite brand being Maille. Dave and I had a morning in Paris during the Air France strike last year, and we did two things before leaving for Munich. We went to the Eiffel Tower which was amazing, and not crowded so we could stand underneath the structure and just gaze at its enormity without being jostled. We also went to the Maille boutique store in place de la Madeleine. We left with a few jars and having loved the tasting experience as much as the shopping itself. This year April we had more time in Paris and our trip included a visit to the store for more trying and spending. I made a note of the prices and as the mustard costs the same at Charles de Gaulle, we left the airport for home in September with another jar. Mustard tasting is an art, and fresh mustard is slightly stronger and sharper than the ones we purchase in jars. I have used this fresh pink peppercorn mustard with honey, olive oil and sherry vinegar to marinade chicken which we then cooked on the braai. I have also made some small jars to add to the Christmas table for take home edible gifts. Such a lovely recipe Tandy. This sounds delicious. My dad introduced me to mustard many years ago when we used to have Christmas ham and cheese sandwiches over the summer, smeared with French Mustard. I have been outside Maille but had no time to go in. Next time! You will have to go back to Paris, just for that! Hi Tandy, this is special I never thought about making my own mustard before, looks delicious! So very cool that you made your own mustard! Looks great and I prefer finer mustards too. The truffle one is amazing! Lovely mustard! Thanks for cooking along with us this month! I would love to make this for Christmas Hamper Gifts! What a fabulous recipe. I will let you know how I go. My good friend makes his own mustard too! Never realised it made that much of a difference until I tried his- beautiful flavour! Will definitely give this pretty pink peppercorn version a go. Sounds just like the perfect Christmas gift too! Mustard is such a fun condiment to work with and to cook with. So I am so loving your recipe on how to make it. I may have to try this out. What a great idea! I’ve never thought to make my own mustard. Love the pink peppercorns in there. Mustard is my favorite condiment and I’m sure your homemade mustard is delicious. Tandy – this is so cool – I’ve never ever thought to make my own mustard – this is fantastic! Thanks so much! Im with you Tandy! 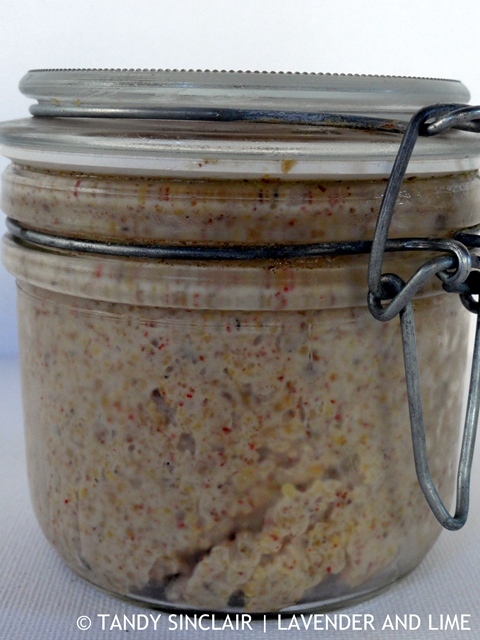 Im not a huge fan of mustard either, but I bet this homemade mustard is delicious! Also, Im super envious you got to visit Paris! I’ve never thought about making my own mustard, this sounds brilliant. Oooh, I love this! I was only thinking yesterday about making my own mustard for Christmas. This looks like a good place to start.